CityWorks(X)po Florida Returns to Winter Haven | Winter Haven Economic Development Council, Inc. 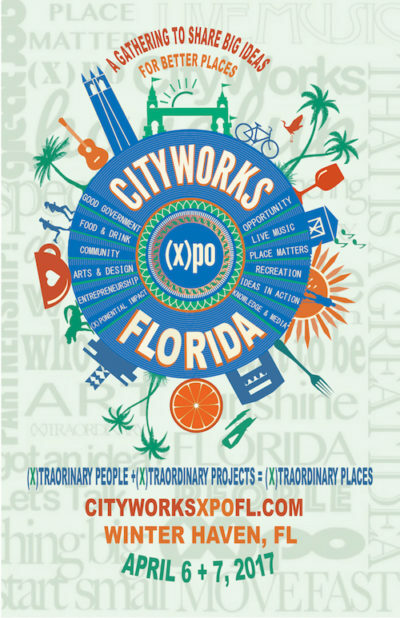 The second annual CityWorks(X)po Florida is coming to Winter Haven April 6-7, 2017, and you won’t want to miss this year’s lineup of speakers. In addition to thought-provoking presentations and engaging dialog during the day, you’ll enjoy evening networking opportunities at high energy events. With generous enthusiasm and support from CityWorks(X)po founder Ed Walker, Main Street Winter Haven, Inc., is partnering with the Greater Winter Haven Chamber of Commerce, City of Winter Haven, Winter Haven Economic Development Council and Visit Central Florida to bring you this placemaking summit, idea exchange and festival-style conference. 5:30–7:00 pm: Check in early and enjoy beer & bites at Grove Roots Brewing Co.
8:00 am: Registration, coffee, juice and lite breakfast bites. 9:00 am: CityWorks(X)po kicks off! 5:30-8:30 pm: Main Street Winter Haven’s Downtown Craft Beer Crawl (map also highlights Winter Haven’s murals and outdoor sculptures). 5:30- 8:00 pm: Join us at Gram Parsons Derry Down for live music presented by Walter Parks and Swamp Cabbage; plenty of food and drink! The Winter Haven Economic Development Council is pleased to be a partner again for this year’s (X)po, which promises to be another inspiring event. We hope you’ll join us to connect, learn and share big ideas to make our communities even better.